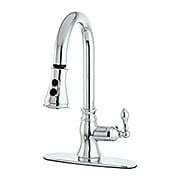 A single handle kitchen faucet is used with a single hole sink, and features a spout with a built-in handle. 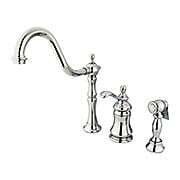 These classic kitchen faucets look good in a wide range of kitchen décors and are available in multiple styles and sizes. The graceful curves and Victorian-inspired details of the Ontario collection bring elegant style and long-lasting performance to your kitchen. This faucet is constructed of solid brass, and comes in your choice of four lustrous, tarnish and corrosion-resistant finishes. It also features an easy-to-use, joystick-style handle and matching side sprayer for directing water right where you need it. The graceful curves and Victorian-inspired details of the Chesapeake collection bring elegant style and long-lasting performance to your decor. Constructed of solid brass, this single handle faucet with side sprayer features a drip-free ceramic cartridge system and your choice of two tarnish and corrosion-resistant finishes. 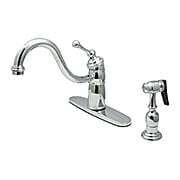 Traditional white porcelain levers and a sculpted side sprayer are the finishing touch to this fashionable ensemble. The graceful curves and Victorian-inspired details of the Chesapeake collection bring elegant style and long-lasting performance to your decor. 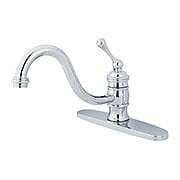 Constructed of solid brass, this one-handle faucet features a drip-free ceramic disc cartridge system, and your choice of two tarnish and corrosion-resistant finishes. 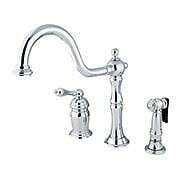 A gooseneck spout and smooth escutcheon, topped with a stylish lever, are the finishing touch to this fashionable ensemble. The graceful curves and Victorian-inspired details of the Ontario collection bring elegant style and long-lasting performance to your kitchen. 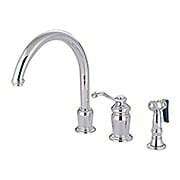 This faucet is constructed of solid brass, comes in your choice of four lustrous, tarnish and corrosion-resistant finishes, and features an easy-to-use, joystick-style handle. The graceful curves and Victorian-inspired details of the Ontario collection bring elegant style and long-lasting performance to your kitchen. This faucet is constructed of solid brass, and comes in your choice of three lustrous, tarnish and corrosion-resistant finishes. It also features an easy-to-use, joystick-style handle and matching side sprayer for directing water right where you need it. Adopted from early 20th-century style, this single-handle faucet combines a sleek silhouette and premium materials for a traditional look and long-lasting wear. Constructed of durable, solid brass, it boasts your choice of three tarnish and corrosion-resistant finishes and a drip-free ceramic cartridge system. With a 13-inch height, the arch spout offers ample clearance to accommodate large pots and pans, and the side sprayer directs water right where you need it. A ringed escutcheon, topped with a stylish lever, adds the finishing touch to this fashionable ensemble. Adopted from early 20th-century style, this single-handle faucet combines a sleek silhouette and premium materials for a traditional look and long-lasting wear. Constructed of durable, solid brass, it boasts your choice of three tarnish and corrosion-resistant finishes and a drip-free ceramic cartridge system. With a 13-inch height, the arch spout offers ample clearance to accommodate large pots and pans. A ringed escutcheon, topped with a stylish lever, adds the finishing touch to this fashionable ensemble. Adopted from early 20th-century style, this single-handle faucet combines a sleek silhouette and premium materials for a traditional look and long-lasting wear. Constructed of durable, solid brass, it boasts a tarnish and corrosion-resistant oil-rubbed bronze finish and a drip-free ceramic cartridge system. With a 13-inch height, the arch spout offers ample clearance to accommodate large pots and pans, and the side sprayer directs water right where you need it. A ringed escutcheon, topped with a stylish porcelain lever, adds the finishing touch to this fashionable ensemble. The Fulton collection blends a sleek silhouette with classic elements, creating a pleasing combo suited for a variety of interiors. 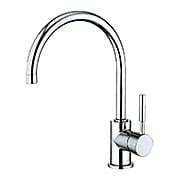 Constructed of durable, solid brass, this fashionable tap boasts a drip-free ceramic disc cartridge system, and offered in a tarnish and corrosion-resistant finish. With an 12" overall height, the arch spout offers ample clearance to accommodate large pots and pans. 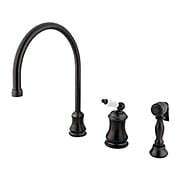 With its sleek silhouette and modern handles, this single-handle faucet brings a crisp, clean look to modern kitchens. Constructed from solid brass, it comes in your choice of two premium, tarnish and corrosion-resistant finishes. The ceramic disc cartridge offers a drip-free experience that is designed to last a lifetime. Adopted from early 20th-century style, this single-handle faucet combines a sleek silhouette and premium materials for a traditional look and long-lasting wear. Constructed of durable, solid brass, it boasts your choice of two tarnish and corrosion-resistant finishes and a drip-free ceramic cartridge system. The side sprayer lets you direct water right where you need it, while the stylish lever adds the finishing touch to this fashionable ensemble. The graceful curves and Victorian-inspired details of the Chesapeake collection bring elegant style and long-lasting performance to your decor. 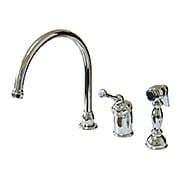 Constructed of solid brass, this kitchen faucet comes in your choice of three tarnish and corrosion-resistant finishes, and features a drip-free ceramic disc cartridge system. An easy-grip curved lever completes this handsome ensemble. Adopted from early 20th-century style, this kitchen faucet combines a sleek silhouette and premium materials, for a traditional look with a modern twist. Constructed of solid brass, it boasts your choice of two tarnish and corrosion-resistant finishes and a drip-free ceramic disc cartridge system. 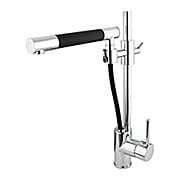 Its two function, pull-down spout offers a stream flow and jet spray for added convenience, while the stylish lever completes the look of this fashionable ensemble. 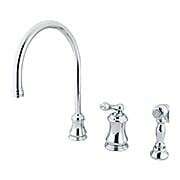 With its sleek silhouette and modern handle, this faucet brings a crisp, clean look to modern kitchens. Constructed from solid brass, it comes in your choice of two tarnish and corrosion-resistant finishes. 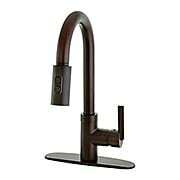 Its two function, pull-down spout offers a stream flow and jet spray for added convenience. The ceramic disc cartridge offers a drip-free experience that is designed to last a lifetime. 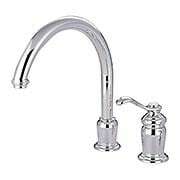 Adopted from early 20th-century style, the Bar Harbor Single-Handle Kitchen Faucet with Arched Lever and Brass Side Sprayer combines a sleek silhouette and premium materials for a traditional look and long-lasting wear. Constructed of durable, solid brass, it boasts your choice of three tarnish and corrosion-resistant finishes. A matching side sprayer directs water right where you need it, while the stylish lever adds the finishing touch to this fashionable ensemble. 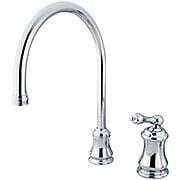 With its sleek silhouette and modern handle, this single-handle faucet brings a crisp, clean look to modern kitchens. 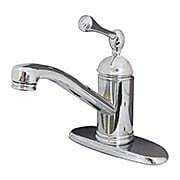 Constructed from solid brass, it comes in a premium, tarnish and corrosion-resistant polished chrome finish. 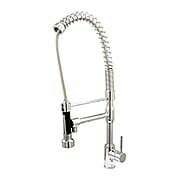 The spout is height adjustable, and removable, allowing you to direct water right where you need it. The ceramic disc cartridge offers a drip-free experience that is designed to last a lifetime.